Esther and Anonymous, 2015. Hair weave, shoe laces, aluminum. 64" x 30" x 7." SARAH BETH WOODS employs a range of artistic methods, including sculpture, film and relational aesthetics in her research-based practice. 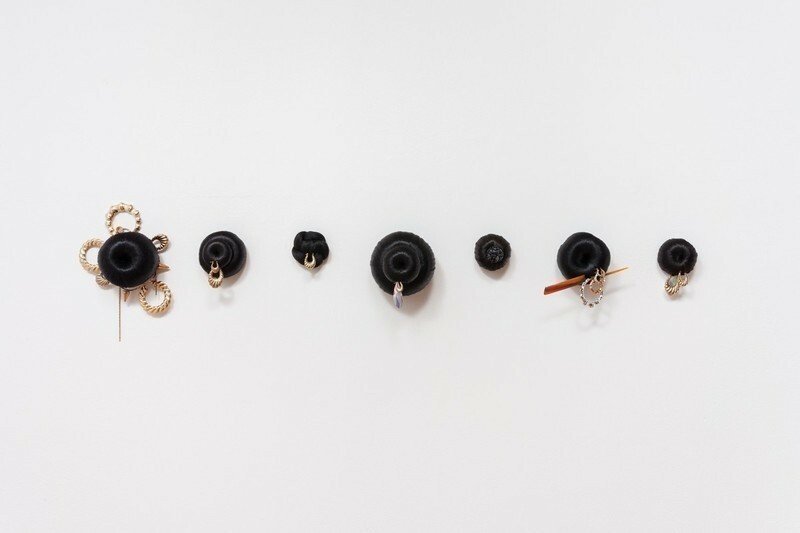 Her sculptural objects and events celebrate the material aspects of feminine adornment—hair braiding, nails and jewelry—and their corollary social spaces. Her formative years on the Southwest side of Chicago influence her ongoing engagement with black, female aesthetics in particular. Sarah earned a BFA at Northern Illinois University and an MFA at the University of Illinois at Urbana Champaign. Her solo exhibitions include Braid & Nails (2015) at Wheaton College and Bricoleur at Azimuth Projects (Chicago, 2014). Sarah collaborated with hair braider Fatima Traore for BRAID/WORK, and they were the recipients of the 2015/2016 Crossing Boundaries Prize. 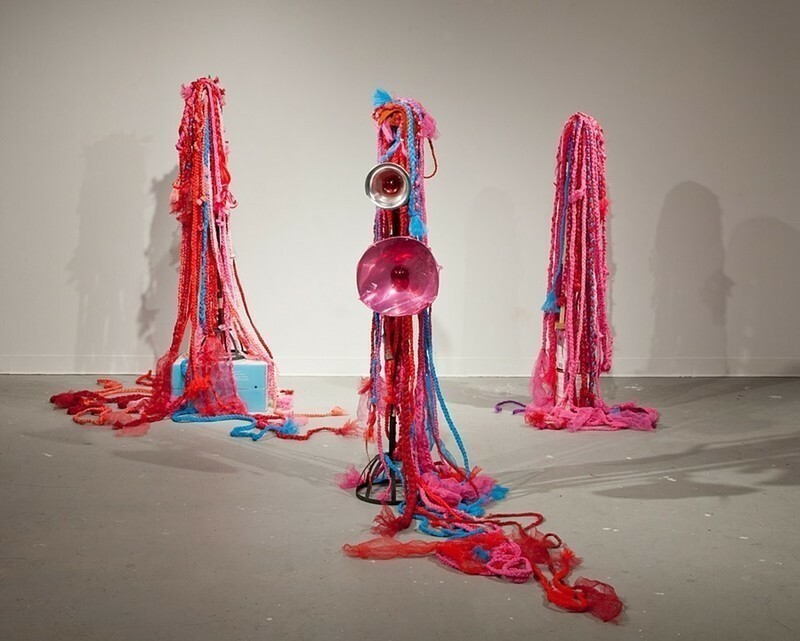 Esther and Anonymous is currently on view in Focus: Fiber 2019 at Kent State University Museum in Ohio through July 28, 2019. BRAID/WORK will be part of a symposium and solo show at Bethel College (Mishawaka, Indiana) in November of 2019. The conceptual girl group The Rhinettes will perform at Experience Threewalls at 15 on June 5th, 2019. Sarah lives and works in Chicago. OtherPeoplesPixels: Can you talk about the relationship between objects and events in your practice? How do you balance these modes of making? Sarah Beth Woods: The majority of my training is as a studio artist. In terms of my process, that always comes first and starts with a specific material. I think of my public events as collective performances. They are an important part of the evolution of the work rather than a means to an end. Recently, events have taken the form of musical performances and collective braiding sessions. I’m interested in the act of braiding and the labor associated with the hand work as a common denominator or language shared by different communities. These events provide pragmatic ways to engage a specific audience while collectively thinking through materials. During Shared Language, curated by Tempestt Hazel at the Arts Incubator, Fatima Traore and I were able to braid and exchange stories with women from the Academy of Beauty and Culture, a beauty school on the West side of Chicago. What does it feel like for a girl?, 2012. Bath poufs, hair weave, ribbon, felt, clamp lights, lightbulbs, steel. 14" x 10" x 58." OPP: What does performance mean to you—both as an art form and in terms of our various identities? SBW: For me, performance has everything to do with process and improvisation. We all perform specific parts of our identities on a daily basis. It’s a performance because it’s not innate; it’s learned and then acted out. During the research phase of my recent 16mm reversal film Hear the Glow of Electric Lights, I became really interested in female body comportment, specifically Maxine Powell’s finishing school at Motown and the methods she employed to train the Supremes to be “lady-like.” Powell spent a lot of time training the women how to get in and out of a car gracefully, with poise and posture. This was a strategic marketing ploy that has everything to do with class and respectability politics. I’m interested in the ways these ideas are inscribed on to the body through repetition and performance. Similar to content in BRAID/WORK, there was a lot of behind-the-scenes labor that went into this process. 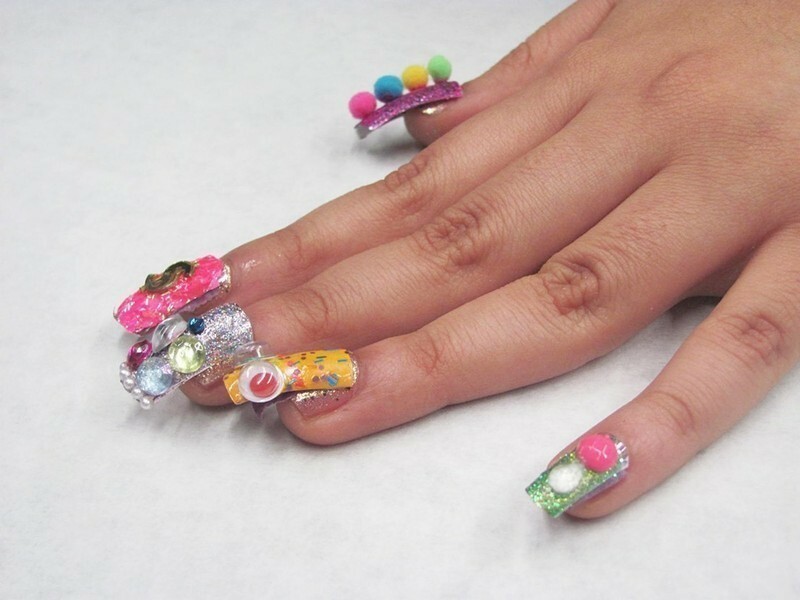 Kayla, 2015. acrylic nails, pom-poms, googley eyes, glitter, confetti. OPP: Tell us about your work with Fatima Traore. How did you two first meet and start working together? SBW: Fatima Traore and I met when she was braiding hair during the Mappy Hair Project at the Gray Center for the Arts in 2013. We started braiding together informally. On some occasions, I would paint nails while she braided. We did pop-up salons for Prime Time at the MCA, the South Side Community Art Center and the 75th Anniversary Block Party at Hyde Park Art Center. We also did work together with Tracer’s Book Club, a group of international, intersectional feminist artists founded by Chicago-based filmmaker Jennifer Reeder. BRAID/WORK, 2016. In collaboration with Fatima Traore. OPP: Together, you were the recipients of the 2015/2016 Crossing Boundaries Prize awarded by Arts+Public Life & the Center for the Study of Race, Politics and Culture at the University of Chicago. What did this prize fund? 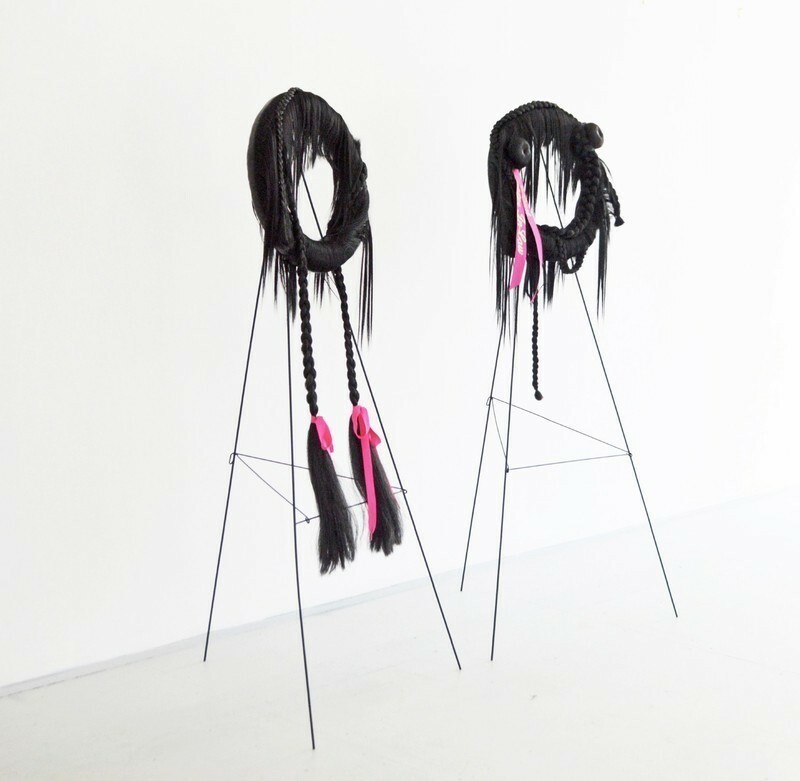 SBW: The Crossing Boundaries Prize allowed Fatima Traore and I to complete BRAID/WORK, a collaboration that investigates the history and aesthetics of African hair braiding through a material and performative lens. We braided hair at Art on Sedgwick, a community art center located in the Marshall Fields garden apartments in Chicago's Old Town neighborhood and The Museum of Contemporary Art Chicago. There was a culminating reception and catalogue release at the Arts Incubator. 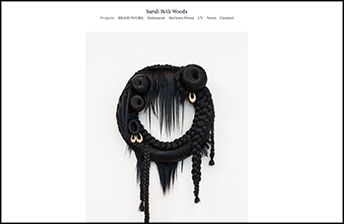 The material components of this project—my hair sculptures and staged photographs of a fictional work space featuring Fatima braiding—were included in a show under the same name at Rootwork Gallery in 2016. The photographs were taken by Cecil McDonald, Jr.
DBL RAINBOW SWEET TWIST, 2016. Hair weave, foam, photo collage, comb, door knocker earrings, chain. 10" x 50" x 9." OPP: What effect did this collaboration have on the work you make alone? SBW: The experience taught me a lot about the ins and outs of collaborative risk taking, as well as potential ways to utilize institutional critique to investigate cultural paradigms embedded in the ways we look, think and critique. I’m currently reading Reversed Gaze: An African Ethnography of American Anthropology by Mwenda Ntarangwi, who examines his own lived experience as an African scholar studying anthropology in America with a focus on representation and self-reflexivity. I’m at a pivotal point with my sculptural work where I’m asking and requiring more from objects beyond their immediate purpose, especially the potential for characters or activations within narrative film. 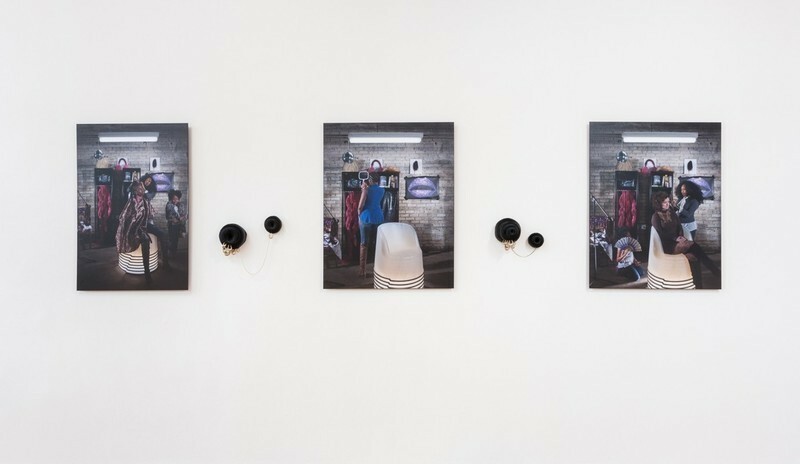 OPP: In 2016, Mailee Hung wrote for Daily Serving about BRAID/WORK :“Woods is a white woman who spent her formative years in a primarily Black, middle-class neighborhood of Chicago, and she is highly cognizant of the dangers of appropriation her privilege affords.” How do you handle these dangers while working with “black material culture” as a white woman? SBW: Fashion and hair style have never been static or fixed things. Style is always in the act of being appropriated, modified, or morphing into something else. Artifice brings these ideas to the surface, because it pronounces itself as artifice. It probes at the boundaries that spring up around markers of identity. I’m much more interested in creolization which actively moves against fixed identities and towards cross cultural, transcultural and hybrid forms. OPP: Most recently, you’ve been investigating the aesthetics of the performances of 1960s girl groups. Who are The Rhinettes and how are they a “conceptual girl group,” as opposed to a girl group? 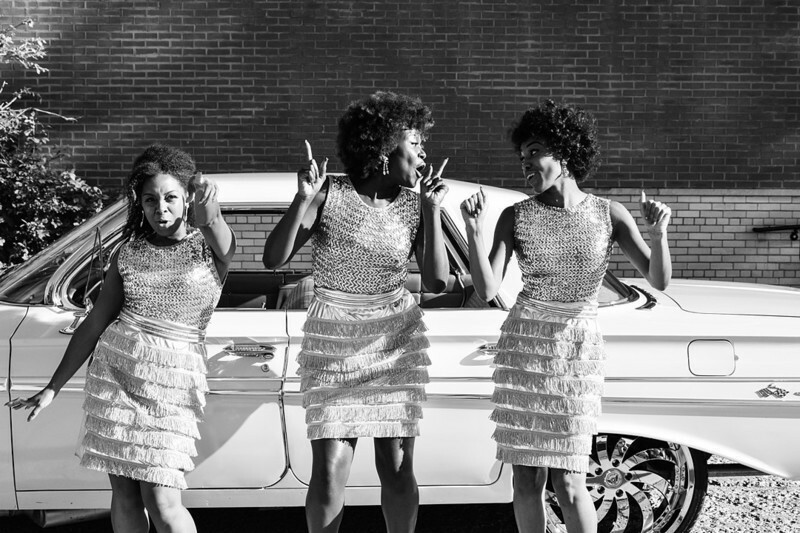 SBW: My interest in artifice and the performing body, as well as black and white cross-over appeal led me to the Supremes’ first performance of “Come See About Me” choreographed by Cholly Atkins on the Shindig television show in 1964. I’m really interested in early girl groups and their first televised appearances, as well as the technological spaces that they occupy. Politically, sonically and visually, it was an important and complex moment in American history. In 2017, I formed what I refer to as a “conceptual girl group” with Anya Jenkins, Alexis Strowder, and Yahkirah Beard, who is a professional dancer. She’s appeared on the television show Empire several times; her energy is incredible! We’re like a conceptual cover band—we don’t record or play instruments, and we only cover one Supremes' song. OPP: How do viewers/listeners encounter The Rhinettes? SBW: We’ve performed at Silent Funny, a mixed-use arts space on the far West side and the Jane Addams Hull House Museum during a series called Making the West Side, which aired on Can TV. The material component of the project is Hear the Glow of Electric Lights, a research-based, 16mm reversal film that I've been working on for several years. The content of the work is revealed through concealment, codes and learned body language, drawing attention to what we’ve been taught cannot simultaneously exist: beauty, power and the political. Pop culture scholar Jaap Kooijman articulated it well: “the power of the image, and in extension the Diana Ross star image, lies in its embodiment of the contradiction between fashion and politics, and its refusal to accept that those two cannot go together.” The remainder of the project is being shot and edited through 2019. To see more of Sarah Beth's work, please visit sarahbethwoods.com.